She’s not necessarily a newbie. In fact, Ms. Malone has been a working actress since 1996. However, she has been overlooked for her peculiar choices and dynamic screen presence. Her first movie role with credit was playing Anna Harrison in the Julia Roberts/Susan Sarandon feel-good film Stepmom in 1998. Next up for the Golden Globe nominated actress, a role in the drama The Wait alongside Chloe Sevigny, a pivotal role as Johanna Mason in the next installment of The Hunger Games franchise, the drama Lonely Hunter alongside Logan Marshall-Green playing Tennessee Williams, and Paul Thomas Anderson’s Inherent Vice starring a heavyweight cast that includes: Joaquin Phoenix, Reese Witherspoon, and Josh Brolin, and the thriller Angelica. And like her character in Sucker Punch, this girl’s career is about to “Rocket”. While this biography has a lot of information about America’s first silver-screen sweetheart, I found it lacking in many ways. For one thing, it seems to skip over a lot. At the beginning of the book, it goes on for about 50 pages saying how nobody in the family wanted to turn to acting, but they had to because they were so poor, and they made good money, which they needed because they were so poor, and it made them feel better about taking jobs as actors because they really needed the money. After that section, once Mary Pickford enters “flickers,” it gets much more bearable. However, it still skips a lot. Her relationship with Douglas Fairbanks comes up sparse. They spend an entire chapter about their growing distance between each other, and their eventual divorce. There’s little tidbits about them before getting married, and a few lines about their marriage, such as “they held hands during dinner,” which is nice, but that can’t possibly be their entire relationship. After their divorce, they each remarry, but it’s said that they would sit by a pool together, sometimes holding hands, without going into further detail about what’s going on, what other people (including their respective spouses) thought about this, and treats this as though it’s perfectly normal behavior. When it talks about United Artists, it’s impossible to know what’s going on if you don’t have prior knowledge to the situation the artists and studios were facing when it came about. For a book subtitled “The woman who made Hollywood,” there’s really not a lot of Hollywood, either. There’s a small bit about movie-making in New York in the early to mid teens, and then there’s the formation of United Artists (which, again, was really lacking in the details), and then there a brief section about the transition into talkies, which didn’t so much describe Hollywood’s transition, but almost exclusively Mary’s transition and that of her studio. It’s hard to understand a person without knowing the world that they lived in. 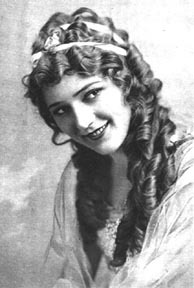 The only thing we begin to understand is the tragedy of Mary Pickford, falling as so many of the other silent stars did, without feeling the full weight of the situation. And lastly, and perhaps what bothered me most about this biography, was the fact that the author puts Pickford on a pedestal. Everything she does is wonderful and she can do no wrong, and when she does do wrong, it’s always excusable in some way, shape, or form. Like when she had an affair with Fairbanks when they were both married to other people. It was okay because her husband was mean to her. And it seemed like every movie she made had some fault such as faulty direction or one of the other actors refused to reshoot a scene. This book makes it seem more like, instead of the woman who made Hollywood, Mary Pickford was really just in the right place at the right time, which outside of that novel I’m not really sure if that is an accurate conclusion because, as I said, this book doesn’t do much justice to anyone. She was there when movies got their start. She was the first actor who had their name revealed to the public at a time when people watched movies based on the studio it came from. Overall, I’m not very impressed with Mary Pickford, or this book, but it sparked my curiosity enough to look forward to watching some of her movies to see if I form a different opinion of her. Besides, the Mary Pickford cocktail is delicious. Whether you’re already there, looking forward to going, or thrilled that that time of your life is over, back to school season has arrived. Not all of us wear ironic “college” t-shirts and climb the social ladder. Just like not all of us study hard and have ambitions to be valedictorian. Whichever way you look at it, college is supposed to be the time where you figure out who you are and your place in this world. Instead of doing that, you should watch movies that star or have someone who said no way to a formal education. By no means am I saying you shouldn’t go to college, but hey, there’s some valid proof that being a dropout doesn’t mean you are a dunce. I know I didn’t pick a Tim Burton matchup (and let’s be frank that shtick is getting really old) but this is a tripped out, hallucinatory movie directed by the one-and-only Terry Gilliam. It’s a head trip of a movie that is hard to forget, and as journalist Raoul Duke, Depp prances around the screen without a care in the world except drugs. That’s right, America’s heartthrob never completed high school! But who cares? Crazy Stupid Love is an honorable mention, but there’s nothing quite like this indie film for which Gosling was nominated for an Academy Award. As an inner-city teacher with a drug problem, Gosling turns in his best performance of all time, minus his trademark charm. Okay, Scarface is the quintessential overly quoted, overly adored by douchebags everywhere movie. However, there is a reason for that. Tony Montana is a money-grabbing, power-hungry Cuban with a machine gun and Pacino is perfect in the role. No matter how many times you watch the movie, there is always something in there to appreciate. Are you talking to me? If you are you should shut up and watch this Martin Scorsese directed classic instead. De Niro is in his prime playing Travis Bickle, a Vietnam veteran who has to moonlight as a cabbie in order to make ends meet. Mixing politics and inner turmoil, this movie is one that you really shouldn’t miss. The Dropout: Robert Downey Jr.
It’s no secret that Iron Man himself was very much into drugs in his early career. However, he was able to bounce back from all of that and is now enjoying a great moment in his career. This film, from director Shane Black, is a highly enjoyable oddball caper that also features Val Kilmer. Rogen, known for countless stoner comedies, is at his lovable finest in this dramedy about cancer also starring Joseph Gordon-Levitt and Anna Kendrick. With his trademark laugh and ability to find the humor in every situation, Rogen is a likable actor who proves he has a little bit of range in this great film. Raising Arizona has a special place in my heart for Cage’s Hawaiian-shirt wearing cuckoo-bird performance. As does Con Air since it is just lovable trash. But Lord of War is Cage’s finest film in that it has a clever story about an arms dealer who questions his morality, a great cast including Jared Leto, and a great visual style.